If you love garlic, then you have to try this amazing traditional Greek skordalia recipe! Skordalia is a rich and hearty Greek potato dip, which takes its name by the basic ingredient used to prepare it and is of course skordo=garlic. Skordalia is a very popular dish especially when celebrating Greek National Independence day, when it is served with batter-fried salted cod. The traditional Greek skordalia recipe can be also made with stale bread soaked in water and squeezed, but the potato recipe is in my opinion the best. It resembles more like garlic flavoured mashed potatoes and can be more versatile, as it can be also served as a side dish with boiled beets, accompanying various meat or fish dishes. For the traditional Greek skordalia recipe, a pestle is used to degrade the garlic with salt and then adding the rest of the ingredients, until smooth. But as this is really time consuming, for this skordalia recipe, a food processor is used, to make things a lot more easier. Make sure to use some good quality extra virgin olive oil, which will give its own unique taste to your skordalia! To prepare this skordalia recipe, start by washing thoroughly the potatoes. Peel the potatoes and place them in a large saucepan. Cover with cold water and bring to the boil. Lower the heat to a gentle simmer and cook for about 30 minutes. (For this skordalia recipe the potatoes need to boil, until very tender.) Drain them in a colander and keep 1/2 a cup of the boiling water. In a food processor add 1/2 a cup of the boiling water, the garlic, red wine vinegar and season with salt. Blend until the garlic is diluted. Cut the potatoes in pieces, add them in the food processor and blend to combine. Pour in the olive oil a little bit at a time, whilst blending, like making mayonnaise. Blend until the oil is incorporated and the mixture is smooth and creamy. 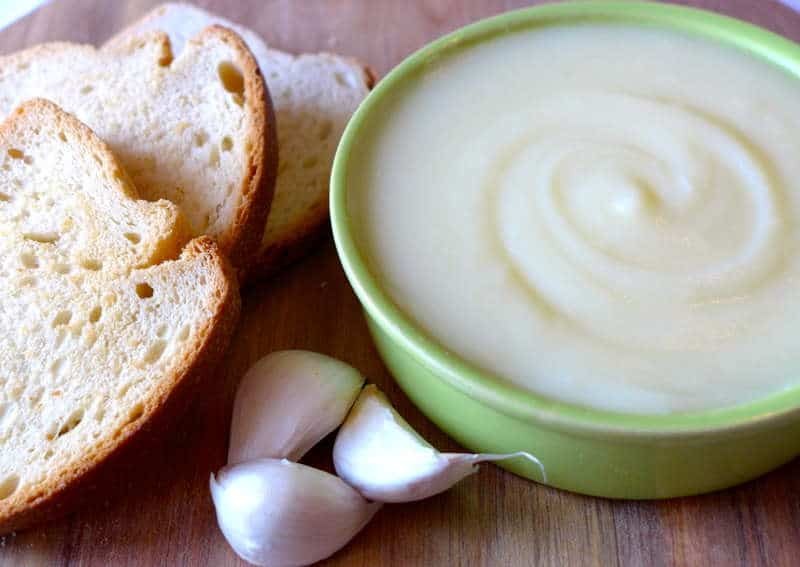 If you like your skordalia to have a mild garlicky taste, a little trick is to boil the garlic (peeled) in some milk for about 5 minutes, before using. When making a skordalia recipe, it is essential, that the potatoes are hot. If the potatoes are cold, then it will be difficult to combine the ingredients and the skordalia will become lumpy. If you don’t have a food processor to prepare this skordalia recipe, you can mash the potatoes with a fork and combine the ingredients, using a whisk. Serve the skordalia as a delicious dip or side dish with some toasted bread or pita breads. Enjoy! Can you freeze it for later? I tasted scordalia back in the 90s and begged my friend for the recipe. She promised to share it. Well she never did. Thank goodness I found this site. I promise to share it with everyone that wants it.